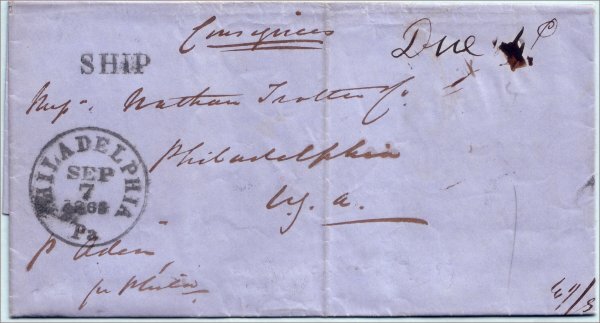 Consignee's letter sent from Liverpool to Philadelphia dated July 11th 1863. Ship Letter Fee: 4¢ (in manuscript: 'Due 4¢'). Reference: United States Incoming Steamship Mail, 1847-1875, 2nd Edition, Theron J Wierenga, US Philatelic Classics Society, Inc. The ship was the 'Aden' and the consignee's letter indicates that it is a Bill of Lading for the delivery of 500 boxes of 7 inch (tin)plate. The docketing indicates that the letter arrived September 8th, 1863.